Beyond just the egg, I’ve been fascinated by the concept of putting eggs on items that don’t traditionally get eggs. For breakfast, a solid bowl of oats topped with an egg is the perfect savory way to start your day. For lunch, salads are always a good option. 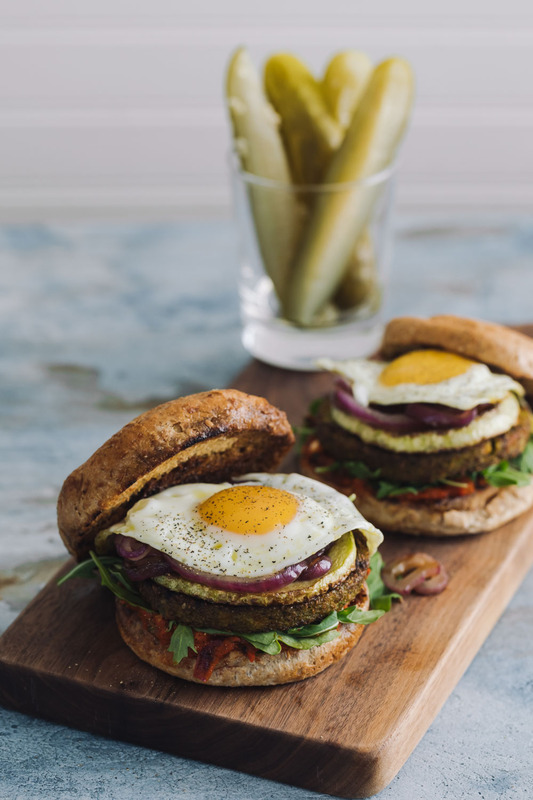 And for dinner, pizza with a fried egg or my new favorite, this loaded veg burger. There’s a couple things going on with this burger. I use grilled vegetables to make a smoky sauce as the base. The arugula adds a nice peppery flavor, and the zucchini brings a great way to add more vegetables. Best of all, the burger is topped with one of Pete and Gerry’s organic eggs. I love partnering with them because I know the eggs come from humanely treated, free-range chickens (and I’m supporting small farmers). Chipotle/Smoked paprika: For an extra smokey flavor, add 1/2 to 1 teaspoon of smoked paprika or chipotle powder to the grilled red pepper sauce. Grilled Cheese: Transfer the sauce, arugula, grilled vegetables, and fried egg to a grilled cheese sandwich. It’s such a great way to elevate the everyday sandwich. Greens: I realize arugula is not for everyone but you can easily swap fresh lettuce or spinach in place of the arugula. While everything is grilling, fry your eggs. I prefer to use ghee and and spoon the ghee over the egg whites, and a couple times over the egg yolks, until everything is set. When everything is grilled, remove the charred skin and seeds from the red pepper. Place in a food processor or blender along with 1 slice (4 to 5 rings) of the onion and all the ingredients for the pepper sauce. Blend until smooth, tasting and adding more parsley or salt as desired. Toast the buns on the grill and layer with the red pepper sauce, arugula, burger, grilled zucchini, extra onions, and a fried egg. Serve while hot.